IQ Option was formed in 2013, and has seen rapid growth over the years, becoming one of the biggest binary options brokerages trading today. The company attracted investors by offering low minimum deposits, and providing a smooth, easy-to-use trading platform. IQ Option has expanded into other trading options, including Forex and CFDs. They offer trading in Bitcoin, Ethereum and other cryptocurrencies. The newly rolled-out v4.0 IQ Options platform has built upon the strengths of the previous version, and brought with it new analysis tools. The binary options trading platform is one of the best in the business; it is visually appealing and can be configured in a way that suits each individual trader. The trading windows can be set with multiple windows on screen, or with one main window and smaller windows underneath. These can all be traded at the same time, and the ability to switch views, and move assets around, makes it much easier to watch the trades. Plot type – This allows the graph format to be changed. Options include the traditional line, bar and candlestick charts. The colour of the graphs can be changed to suit individual preference. 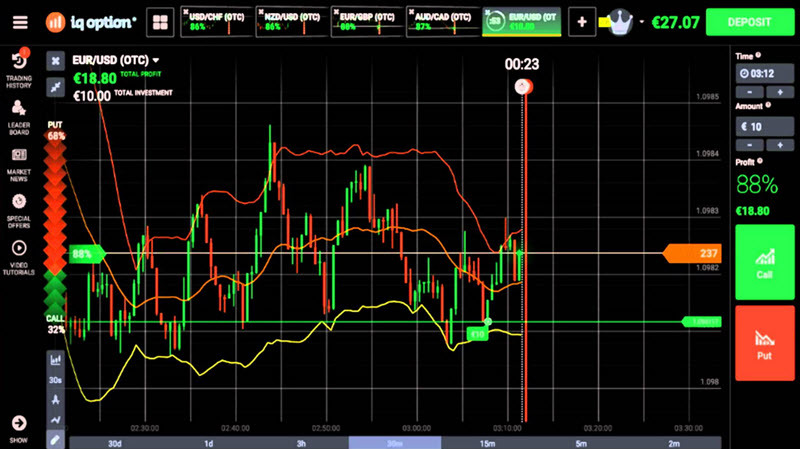 Indicators – There are 9 technical analyses that can be placed as an overlay to the graphs. Each tool can be configured to the trader’s preference. Graph tools – These allow the trader to add their own trends, supports, or resistance lines to charts. These are tools that can help traders choose timings, and watch trends that are of particular interest to them. PayPal is not an accepted payment method on IQ Options, and there is a minimum deposit of just £10 to create an account and start trading. There is a VIP account package, and this is automatically added for deposits of £3000 or more. VIP IQ Options traders get a range of benefits, including better returns on some markets, VIP training manuals and an account manager. Withdrawals are available via the same methods as deposits, though verification processes are sometimes required and can result in delays. The IQ Option customer support team can be contacted via email, telephone or the online help-desk. Support is offered in 18 different countries including Germany, Spain, Brazil and Thailand. The IQ Option trading system is one of the most popular in the industry and, with a simple interface and lots of configuration options, it is easy to navigate and use. Traders, whether new to the industry or seasoned experts, are drawn to the IQ Options system because of the excellent quality of reporting and analysis. This is backed up with an excellent customer support team, along with the most popular methods for withdrawing and depositing funds into an online trading account. IQ Options has both an online trading platform and a mobile app for trades, making it perfect for full-time traders or anyone looking to dabble in the market.